With the holidays soon to be close at hand, a friend of mine asked me if I would do a brief discussion of the basics of turkey cooking; kind of a Turkey 101. Sure, why not, I thought. 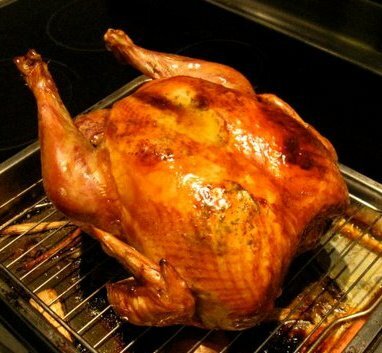 I love cooking turkey, and moreover, eating it. For many, however, the thought of cooking a turkey sends shivers down their spine, and memories of desiccated and flavorless birds of holiday’s past. So I decided to give some pointers to allay these fears and increase the holiday bliss. The first thing, and the most obvious, is buy a good bird, and an appropriately sized one. Stay away from birds that have been injected with butter or saline, as the meat will be mealy. Ideally, buy fresh not frozen. If you have to buy frozen, make sure you allow plenty of defrosting time: at least three days. Buy the best bird you can afford; organic and heirloom varieties are preferable, but they are understandably out of reach for some. A Shady Brook Farm will work just fine if treated with some TLC, but avoid the Butterballs of the world… we can add our own butter. Also, make sure you buy the size you need. A 22 pound turkey is unnecessary for four people, is going to take a long time to cook, is heavy and hard to handle, and will leave you with a ton of leftovers. A twelve pound bird will do the job just fine and will make for a far easier day. The second thing I can’t stress enough is the importance of doing as much in advance as possible. You don’t want to be turkey wrangling and preparing five sides from scratch at the same time. It is stressful, and it will lead to compromises. It is okay to make that stuffing a day in advance, and to peel the potatoes for the mash and leave them in a bucket of water overnight in the fridge. Cranberry sauce can be made a day or two ahead no problem, as can most desserts. The mirepoix (fancy French for the flavorful veg mixture the turkey will be roasted with) can also be cut ahead of time. If you are really thinking, you can also make a base for your gravy days ahead with some flavorful chicken stock; all you will need to do then is add some of the pan drippings and you will have a rich, flavorful, and easy sauce. Preparing things ahead of time allows you to free yourself up and enjoy the day, which is what it is all about, no? Now it is time to get down to cooking techniques, and the one thing I can’t stress enough is proper oven temperature. For years the popular wisdom was “low and slow” as home-cooks figured that would ensure a moist bird. In fact, just the opposite occurred, as long cooking times dried the bird out. What you want is to cook the turkey as quickly as possible, so it retains as much of juice as possible. Obviously too high of a heat will scorch it before it ever cooks through; thus temperature variation is key. You want to start the turkey on a relatively high heat, 450 or so to give it color, and then drop the heat to around 325 – 350 for the remainder of the cooking time to allow it to cook through. If the skin looks like it is getting too dark, tent it with foil. Another technique that can be used is to cover the turkey with strips of bacon, thus providing self-basting throughout the remainder of the cooking time (although this will affect the skin coloration and crispiness to some degree, as well as the flavor of the pan drippings). And baste your turkey often. I use apple cider, but you can use the pan drippings or whatever flavorful liquid you like. This is where your creativity comes in. Probably the second most common question is brine or not to brine? Before answering, I guess I should establish what a brine is: essentially, a brine, is a 5 % salt solution by volume used to change the cellular structure of meat thus allowing it to hold more liquid, ie. stay juicier. It is commonly used with dryer meats, like chicken, turkey and pork, and allows meat that is even slightly overcooked to remain juicy. Brines needn’t be strictly just salt and water, however, but can contain multiple flavoring ingredients, as well as some sugar to compensate for the harshness of the salt. I like to make my Turkey brine with equal parts water and apple cider, as well as including apples, onions, carrots, clove, garlic and some brown sugar. A good working ratio is 1 cup of salt and 1/4 cup of brown sugar for every gallon of liquid. The ingredients should be heated together and then completely cooled before immersing the turkey. Depending on the weight of the turkey, you can brine for up to three days in the refrigerator, allowing a day for the turkey to rest as well to redistribute the seasonings. So if brining makes the meat stay juicier, why wouldn’t I want to do it? Well, for one thing, the texture changes when you brine meat. It becomes juicier, but also softer, and not everyone likes that. Secondly, brining takes time and space. If it is cold enough you can do it covered in your garage, but if not, you have to think days ahead and clear a significant amount of fridge space. Besides, you don’t need to brine to get good results. I have gotten excellent results without brining, but it does take more care. If you are inclined to brine, I say go ahead by all means. It gives you the most flexibility if you want to cook the bird whole and have it come out juicy. Just remember it takes time, space, and planning, so if you do brine allow for all three. If you decide not to brine, as most will, there are some essential techniques to help ensure a moist bird. The first is to place herbed butter underneath the skin. Essentially, mix softened butter with your favorite chopped herbs, allow to harden in the fridge, and then slice into pats and place under the skin. This will provide for a self-basting that will make the bird juicy and flavorful. Use a flavorful mirepoix and rest the bird right on top. Carrots, parsnips, celery, onions, apples, garlic, herbs, and some lemon slices will all release juices that will keep the turkey moist and also flavor the pan drippings for the gravy. Trussing the turkey can help as well. Trussing is simply tying the turkey to maintain it’s shape. I like to put herbs, lemon, and apple wedges inside before I tie it up, which also adds flavor and moisture. And as mentioned above, you can also lard the turkey with bacon or another fat, but be sure to baste liberally no matter what. If you are still worried that the breast may overcook before the legs are done (a problem especially on larger birds) remove the legs beforehand and expose the thighbone so they will cook at approximately the same rate and you can remove the breast if necessary. Also, try and cook the breast meat to 155 degrees and the legs to 170, as they will still continue to cook after being removed from the oven. And that is another necessary part of the operation, resting the meat before cutting. This will allow the juices to distribute throughout the meat. If you cut too soon after removing from the oven, the juices will run out and the meat will be dry, so rest it for at least 15 to 20 minutes, but preferably 30. The best tool in any kitchen, and I can’t stress this enough, is common sense. So while I have provided a few guidelines above, let your senses be your guides. Look at what is happening in the oven, smell what is happening, taste the juices in the pan, listen to the sizzle as it cooks, and touch to determine the firmness of the meat. If you keep it simple and prepare properly, you will be surprised at how good your own food can be.